You've added Gomatgiri, Lal Bagh Palace, Bijasen Mata Temple, and other attractions to your itinerary. To find where to stay, maps, other places to visit, and tourist information, use the Indore tour planning site . Chennai to Indore is an approximately 4-hour flight. You can also drive; or take a train. Traveling from Chennai in April, Indore is little chillier at night with lows of 24°C. Wrap up your sightseeing by early afternoon on the 20th (Sat) to allow time for the car ride to Ujjain. Start off your visit on the 20th (Sat): get to know the fascinating history of Ujjain Simhasth Kumbh. To see where to stay, reviews, photos, and more tourist information, use the Ujjain online sightseeing planner . You can drive from Indore to Ujjain in an hour. Alternatively, you can take a train; or take a bus. In April in Ujjain, expect temperatures between 44°C during the day and 24°C at night. You will leave for Mandu on the 22nd (Mon). 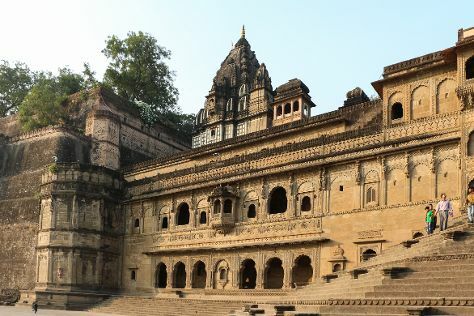 Mandu or Mandavgad is a uninhabited ancient city in the present-day Mandav area of the Dhar district. Kick off your visit on the 22nd (Mon): don't miss a visit to Jami Masjid, then admire the striking features of Hindola Mahal, then admire the striking features of Ship Palace (Jahaz Mahal), and finally contemplate in the serene atmosphere at Shri Mandavgarh Teerth. To find more things to do, maps, ratings, and more tourist information, read our Mandu trip itinerary website . Drive from Ujjain to Mandu in 3 hours. In April, plan for daily highs up to 44°C, and evening lows to 24°C. On the 23rd (Tue), wrap the sightseeing up by early afternoon so you can drive to Maheshwar. Maheshwar is a city in Khargone district of Madhya Pradesh state, in central India. To see photos, other places to visit, ratings, and tourist information, go to the Maheshwar trip builder site . Traveling by car from Mandu to Maheshwar takes 1.5 hours. Expect a daytime high around 44°C in April, and nighttime lows around 24°C. Cap off your sightseeing on the 23rd (Tue) early enough to go by car to Omkareshwar. Start off your visit on the 24th (Wed): contemplate in the serene atmosphere at Mamleshwar Temple, contemplate in the serene atmosphere at Omkareshwar Temple, take in the spiritual surroundings of Omkareshwar Parikrama, then take in the spiritual surroundings of Gauri Somnath Temple, then contemplate in the serene atmosphere at Satmatrika Temples, and finally take in the spiritual surroundings of Omkar Mandhata Temple. Quickly create a custom-made itinerary for Omkareshwar using our trip planner. You can drive from Maheshwar to Omkareshwar in 2 hours. April in Omkareshwar sees daily highs of 47°C and lows of 26°C at night. On the 25th (Thu), wrap the sightseeing up by early afternoon so you can drive to Indore. Kick off your visit on the 25th (Thu): contemplate in the serene atmosphere at Kanch Mandir. To find ratings, other places to visit, maps, and more tourist information, refer to the Indore trip itinerary builder . Drive from Omkareshwar to Indore in 2.5 hours. You'll have a few hours on the 26th (Fri) to wrap things up before traveling home.